Dana Auriemma began her professional career in marketing and sales, working for Johnson & Johnson along with other Fortune 500 companies. She has over a decade of experience in brand and business development, consulting, and sales planning. But having grown up with a passion for dance, movement, and fitness, Dana moved out of the corporate world and became a Pilates instructor. 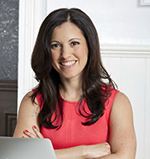 She opened, grew, and sold a successful Pilates studio, winning "Best Of" awards each year. Dana is now dedicated to helping other fitness studio owners and instructors master the business skills they need to reach their full potential. She teaches professional marketing strategies and business techniques that can help studios grow in an intelligent and sustainable way. Dana offers one-on-one consulting, online courses, and free training articles available on her website, www.danaauriemma.com.